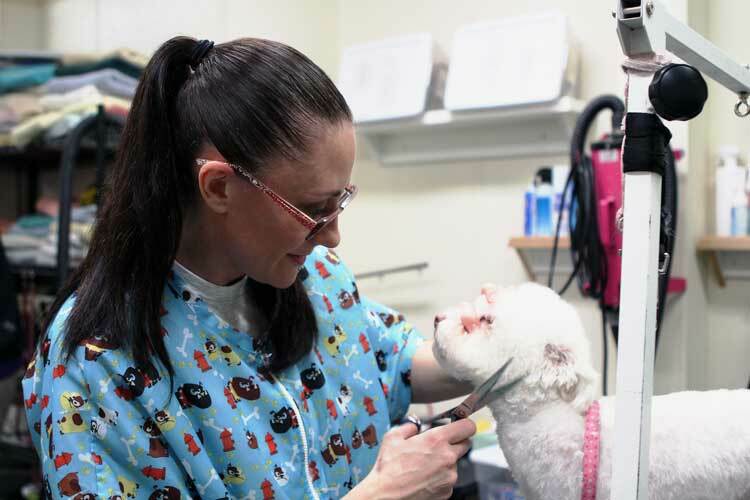 GIG HARBOR – Alyssa Knight uses a pair of sheers to trim the curly white fur around the snout of a 1-year-old Bichon Frise named Gracie Sue. She gently lifts Gracie Sue’s paw, and trims some overgrown fur between her paw pads. Knight’s work station looks like most others inside a groom shop. Except it’s inside a prison. 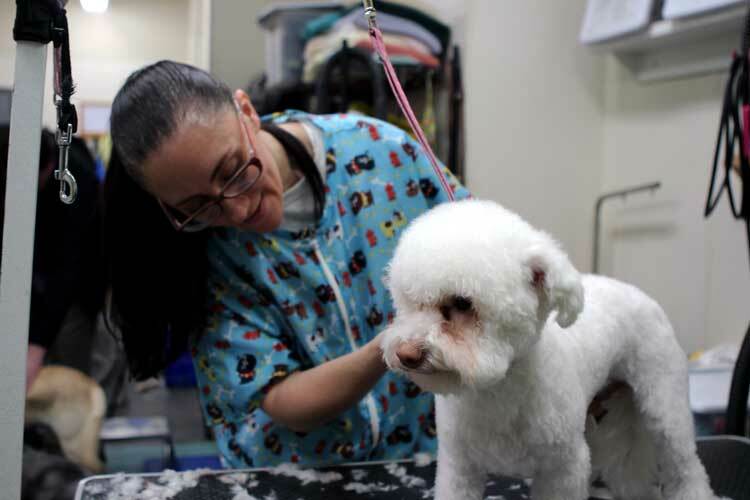 Knight is one of 17 inmates at the Washington Corrections Center for Women who are working in the prison’s dog boarding and grooming program. Knight has served 13 of her 18 year sentence for robbery and second degree murder convictions and says dog grooming will be the key to helping her find a job and staying out of prison when she releases in 2025. 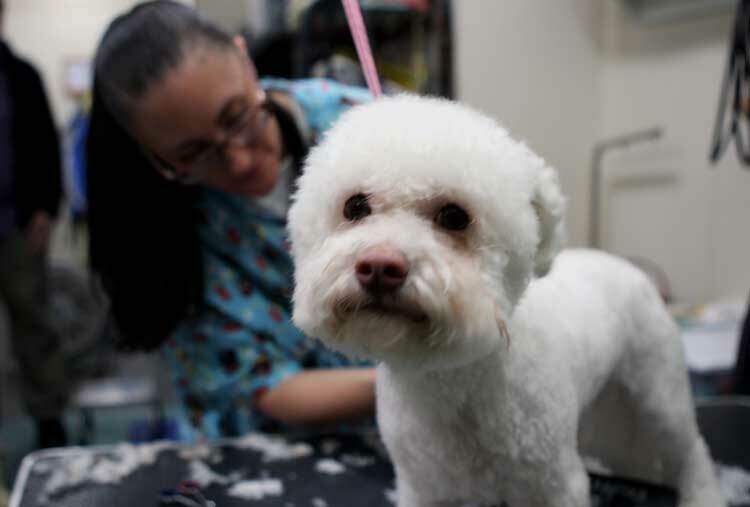 The grooming and boarding program is run though the non-profit organization, Prison Pet Partnership (PPP). Since the early 1980s, the PPP earned recognition for bringing homeless animals into prisons for inmates to train to adopt out as pets or service animals for people with disabilities. 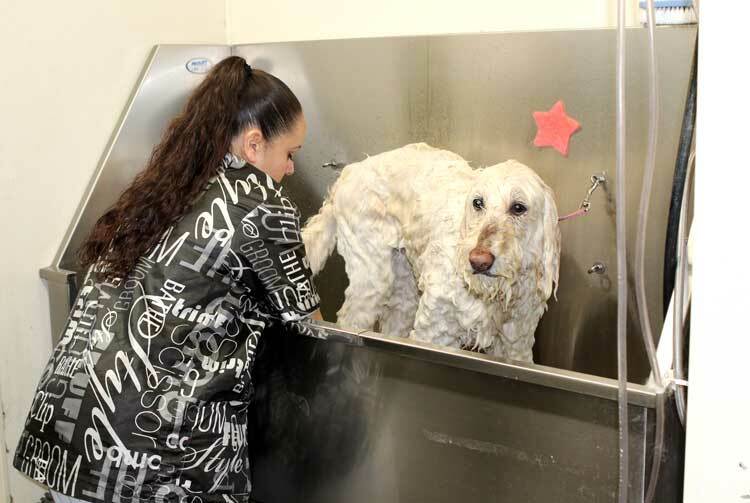 However, it expanded its programming in 1996 to include grooming and boarding services at the Gig Harbor prison. Six percent of the organization’s annual operating budget comes from the Department of Corrections stipend. The rest comes from special fundraising events, in-kind donations and grants. Revenue is also generated from boarding, grooming and training program fees as well as dog adoption fees. 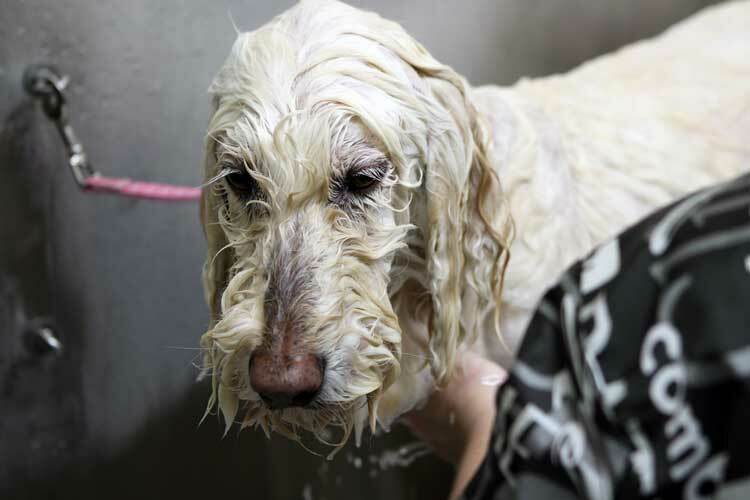 Members of the public can bring their dogs to the prison for grooming and/or boarding. The “groom room” has several tubs and stations where inmates bathe, groom and style dogs. It has 28 indoor dog kennel runs for canine boarding. Inmates exercise the dogs several times a day. Clients also have the option of having the inmates give their dogs some basic obedience training. The prison also has 12 cat boarding kennels. The program currently has more than 2,000 clients, according to Vocational Program Manager Rachel Keeler. Clients learn about the program through several outreach events. Many new clients learn about the program by word-of-mouth. Keeler says it can be scary for a pet owner to think about bringing their pet to prison, but there’s a lot staff and inmate workers do to put clients’ minds at ease. Participants in the program must meet a strict set of requirements and undergo rigorous training to ensure their own safety as well as that of the animals’. Inmates must remain infraction free for a year and have obtained a GED or high school diploma. They cannot have any convictions for crimes against animals or vulnerable people. A certified instructor and correctional staff supervise them at all times. Tools are locked and secured when not in use. Inmates are required to complete a 12-week course that teaches proper handling techniques, pet first aid and care. Additionally, all animals that enter the facility are required to be current on all vaccinations, including rabies. Like Knight, many of the inmates begin working as kennel attendants before transitioning to the grooming program, where they socialize, feed, water, exercise and clean up animal waste. They learn to interpret dogs’ body language and behaviors. Once they get accepted into the grooming program, they practice clipping nails, cleaning ears, brushing teeth and safely restraining dogs who may be anxious or frightened. They also learn ways to prevent body fatigue, since grooming often requires long periods of standing or lifting large animals. Knight said it took a while for her to become confident in her grooming skills. For the first six months, she wasn’t happy with how her trims looked. 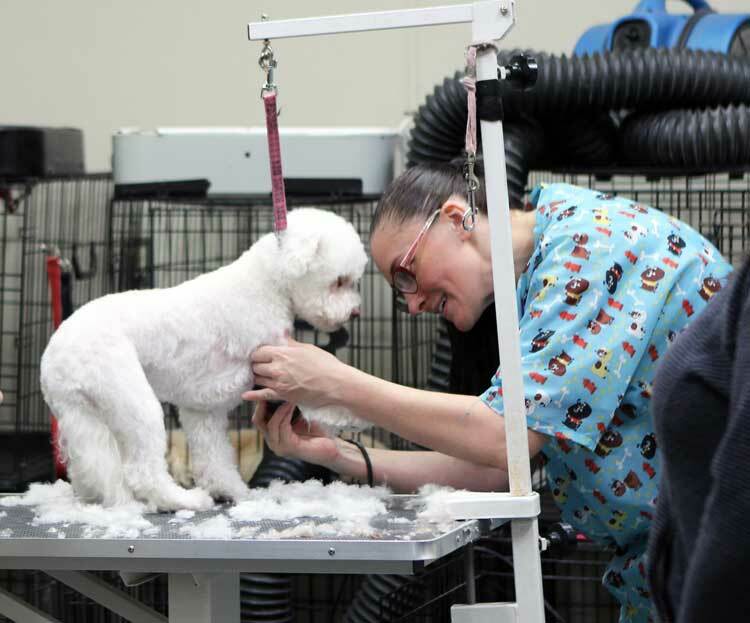 Inmates can earn various levels of grooming certifications, up to a master groomer certification from the International Professional Groomer’s organization. 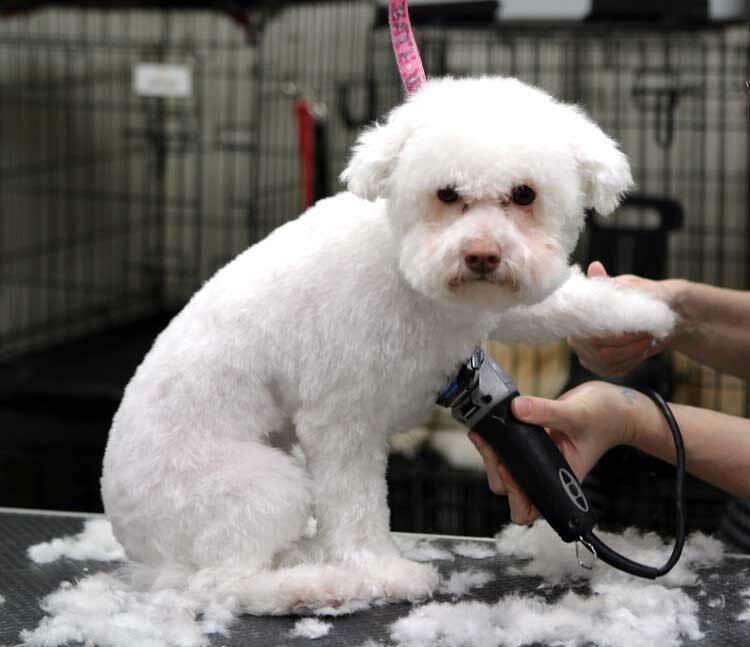 The certification requires extensive knowledge about breed standards, basic anatomy and skin and coat conditions. 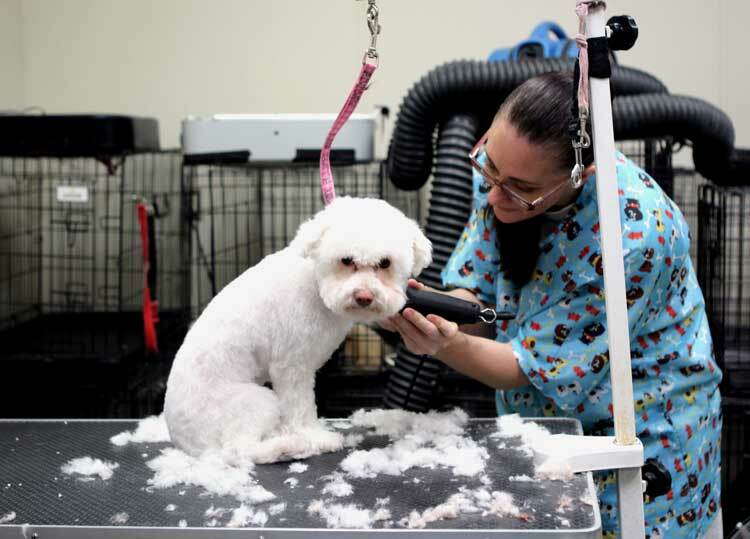 The U.S. Bureau of Labor Statistics (BLS), has predicted job growth for animal care and service workers, which includes pet groomers, will increase about 20 percent between 2016-2026, a faster than average growth rate. 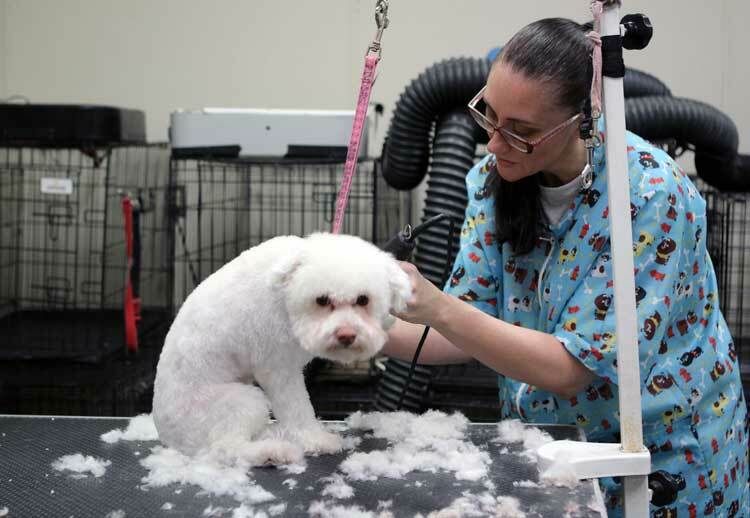 BLS reported strong job opportunities for pet groomers due to the increasing number of households that own pets and a high turnover in positions. As of 2016, animal care and service workers earned a median pay of $22,230. Keeler says in the 12 year’s she’s worked within the PPP, many inmates who earned certifications during their incarcerations have gotten jobs as groomers. Funding from grants and donations allows the PPP to offer scholarships to women in the program releasing from prison. It pays for a set of grooming tools. Some women have also used the scholarship to attend grooming school. Keeler said one inmate recently used the scholarship to enroll in a vet tech program at a local college. She says watching women start to fulfill their aspirations is the best part of her job. Knight says she’s an example of that. For more information about the prison’s grooming and boarding services, visit the Prison Pet Partnership website.